eG Innovations and Egenera, a pioneer in management and automation for physical, virtual and cloud infrastructures, today announced a global technology alliance. The partnership will enable Egenera to incorporate eG Enterprise performance management software into Egenera’s PAN Manager software. The combined solution will give joint customers true end-to-end visibility to more accurately understand performance at every layer of the IT stack and to quickly address issues to ensure optimal service availability for mission-critical business services. Egenera’s PAN management suite provides an infrastructure management solution for physical, virtual and cloud-based environments that enables enterprises to quickly create and benefit from automated and self-service infrastructures. 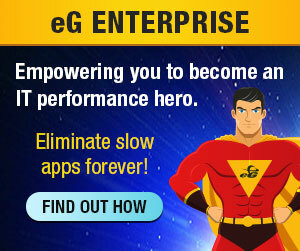 Customers use Egenera products to transform their static IT environments and deliver scalable and reliable IT services. As a result, IT is radically improved and businesses operate with much greater agility. Automate the delivery of IT services to meet the needs of a diverse end user community, accurately understand what is happening at every layer of IT and quickly address issues and challenges to ensure optimal availability for mission critical business services. To learn more about this strategic relationship, visit eG Innovations at www.eginnovations.com and Egenera at www.egenera.com.